:17 - Ray Horner is back from his vacation, and a topic that’s near and dear to the show hosts’ hearts is the future of malls, specifically Chapel Hill Mall in the Akron/Tallmadge/Cuyahoga Falls area. The lights are on today, but what will the future look like? 12:29 - Akron will have a weekend spotlight during the sixth round of the NFL Draft this year, and the eyes of football nation will be on Lock 3 for a pick. Chief of staff James Hardy stopped by the studio to promote this event, along with some questions on the cyber attack and more on Chapel Hill. 23:21 - As always on a Monday morning, veterinarian Dr. Gary Riggs comes by to answer questions on your pets. If you’re interested, Dr. Riggs has offices in Norton and Barberton. 33:32 - Finally, we have our Business of the Week! Today, Alex Randles from Roadrunners Tires was honored. Segment sponsored by HEARINC. and TLC Catering. The trees of Issue 4 are beginning to bear fruit. One of those fruits is a new fire station in Middlebury. Akron mayor Dan Horrigan joined the Ray Horner Morning Show to talk about replacing fire station #2 over on East Market Street. Horrigan has stressed the monies from Issue 4 will be split into thirds, and fire is one of those categories. The other two are police and streets, and more than 54 miles of road will be resurfaced this year. The mayor also talked about the Hamburger Festival hiatus. Due to the construction downtown, Horrigan believes the Hamburger Festival would have had a difficult time operating, though other events at Lock 3 should not be affected. Every so often, the mayor of Akron, Dan Horrigan, stops in the WAKR studios to discuss an array of topics throughout the city. One of those topics, as mentioned on the Ray Horner Morning Show, was about the continued development in downtown Akron, which include Lock 3 and Lock 4. Mayor Horrigan took a trip to Philadelphia, and a plan is to model the civic commons after the City of Brotherly Love. The mayor mentioned he outsourced some opinions on what to do with the future of the Innerbelt to get an outside and fresh perspective. Horrigan also talked about the initiative about retirees paying for insurance, which, as he admits, may not be the most popular moves by the city, but needed to be done. West Bowery Street between Center Street and South Main Street will be closed starting at 4:00 PM. 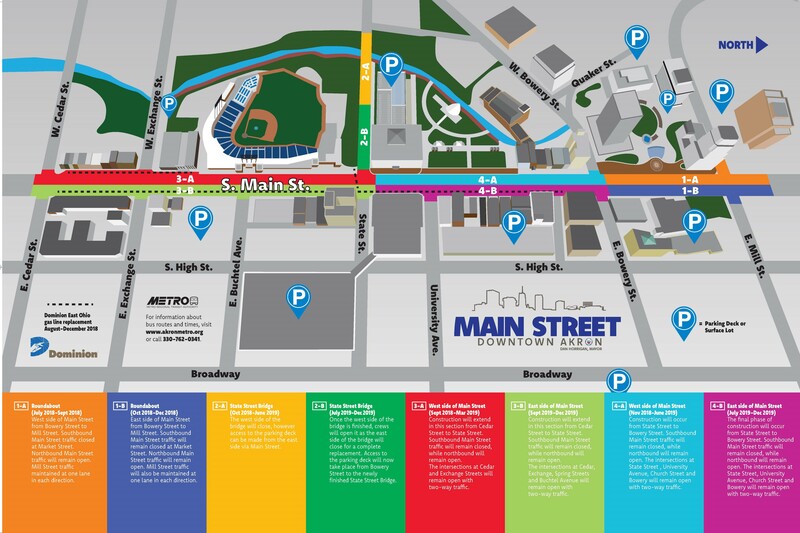 South Main Street between Mill Street and Exchange Street will be closed starting at 5:00 PM. Church Street and University Avenue between High Street and South Main Street will be closed starting at 5:00. Those attending with disabilities who require special parking access are encouraged to use the Cascade and State Stree parking decks. Gates for the event will open at 7:00 PM, and it is standing room only. There's an official celebration for Akron's LeBron James set in his hometown. It will be Thursday at Lock 3. Gates will open at 7 PM, and both admission and downtown parking will be free. The event will feature LeBron, and his students from the Wheels for Education and iPromise Network programs. (City of Akron, news release) The City of Akron in collaboration with the LeBron James Family Foundation will host a celebration for Akron's own, LeBron James on Thursday, June 23 at Lock 3. Gates open at 7 p.m.
LeBron and his students from the Wheels for Education and IPromise Network will be featured. Additional details, including program line-up and street closures will be announced in a separate press release. Admission to the event, as well as parking downtown will be free. Presenting sponsors currently include: Akron Children's Hospital, Goodyear Tire & Rubber Company and Summa Health; along with supporting sponsors; Bridgestone Americas Tire Operations, LLC, Cleveland Clinic Akron General, FirstMerit Bank, GOJO Industries, Huntington Bank and the University of Akron, and media sponsors Channel 3 News and Rubber City Radio Group. The ice skating rink at Lock 3 opens today (Friday) -- a week before the official grand opening of this year's winter lineup in Downtown Akron. New to the winter lineup this year is an indoor/outdoor skating rink, sponsored by the University of Akron, with a polymer surface for beginners 14 and under. That will open next Friday, November 27, along with many of the traditional events schedule, including the annual Holiday Tree Lighting Festival. THE ICE RINK: The Lock 3 ice rink opens Friday, November 20, 2015 through Presidents Day, February 15, 2016. Admission to the ice rink is free to everyone. Skates can be rented for $3. Skate rental closes 1⁄2 hour before rink closes. ZIPPY'S LITTLE ROO RINK: Presented by The University of Akron, Ohio's Polytechnic University. The 28' x 48' rink designed for beginner skaters, age 14 and under, is an all weather, indoor/outdoor synthetic skating surface and is one of our newest attractions to Lock 3! Zippy's Little Roo Rink will operate during the same hours as the Ice Rink. AKRON CHILDREN'S MUSEUM POP-UP SITE: Explore the emerging Akron Children's Museum Pop-Up Site, presented by PNC at Lock 3 this winter! Families can explore, create, build, and move through our interactive exhibits designed to inspire the imagination. Admission is $3.Open Wednesday-Saturday 11 am – 7 pm and Sunday 11 am –5 pm. Check Akronkids.org for more information. POLAR PUTT-PUTT: 9 holes of indoor putt-putt golf that winds through festive holiday decor. Fun for all ages. $3 for 9 holes. THE HOLIDAY TREE LIGHTING FESTIVAL: On Friday November 27th at 7 p.m. the City of Akron and Downtown Akron Partnership will light up the night sky over Lock 3. The half hour program hosted by WONE's Jeff Kinzbach will feature North East Ohio native, The Voice's Jacob Rummel and end with the lighting of spectacular displays throughout Lock 3 & a must see pyrotechnics show. It is also tradition for guests to stay after the show and ice skate into the night. THE WELCOME SANTA PARADE: Saturday November 28th at 11am. This annual family tradition features over 75 units including marching bands, floats, costumed characters, dance groups and area organizations. The parade will end with Santa coming to town! Santa will stop at the main stage for the end of the parade entertainment and then come to Lock 3 to meet everyone. All Lock 3 attractions will be open. REINDEER RUN: Enjoy 150 feet of downhill fun on our all-season polymer coated slide designed for children 14 and under. Adults may accompany children on the slide. Only sleds provided by Lock 3 may be used and are rented for $3 for 30 minutes. The number of sleds available each half-hour will be limited to ensure maximum fun. Purchase wristband and time slot at Skate Rental Desk. BREAKFAST WITH SANTA: Enjoy Breakfast with Santa on December 12, 13, 19 and 20 from 9:30-11am. Breakfast is $10 and includes pancakes with lots of yummy toppings, sausage, hot chocolate and orange juice. A ticket to ride the Magical Train, access to the Akron Children's Museum Pop-Up location, and your choice of a skate rental, Reindeer Run wristband, or a game of polar putt-putt. Bring your camera for plenty of photos with Santa! Reservations recommended by calling Lock 3 at 330-375-2877. COUNTOWN TO FIRST NIGHT: A celebration in diversity and the largest community visual arts display in Northeast Ohio is Lock 3's "Countdown to First Night," featuring 40, hand-painted banners from schools, churches, community centers, ethnic organizations and civic groups - each one illustrating an expression of the winter holiday season. Lock 3 unveils a new banner on the State Street Parking Deck façade each evening, between Nov. 27 and First Night. THE MAGICAL TRAIN: Enjoy a drive through Lock 3 on this trackless train that holds both adults and children. Fare is $3 for adults and children. THE VINTAGE ONEIL'S WINDOW DISPLAYS: The famous classic department store animated window displays that Akronites remember from the 1960's through the 1980's will be displayed in the windows of the O'neil's and Polsky buildings on Main St. Displays include The 3 Little Pigs, The Wizard of Oz, 3 Men in a Tub, Alice In Wonderland, The Cabbage Patch Kids, Raggedy Ann and more. CRAFT IN SANTA'S WORKSHOP: December 3, 10, 17 from 5:30 p.m. - 8:30 p.m. in Santa's Workshop (located inside Polar Putt Putt). Children 3-12 years old. FREE. Looking for a fun evening out with the kiddies? Join Santa and his helpers making crafts inside Santa's workshop! Lots of fun craft projects to choose from. You make it and then take it home with you! Enjoy photo opportunities with Santa and complimentary cookies and punch. Lots of holiday fun! CRAFTY MART PRESENTS COTTAGE MART: For the first time, Crafty Mart is hosting a holiday pop-up market with a curated collection of our area's finest artists and makers in the outdoor wooden cottages. Enjoy ice skating, the new Children's Museum space, have a cup of hot chocolate, and stroll through the outdoor marketplace. Do your holiday gift shopping for locally-made items by small business makers for one weekend only. Saturday December 5th 11 a.m.-7 p.m. and Sunday, December 6th 11 a.m.-5 p.m.
AKRON2AKRON HOLIDAY WALKING TOUR: Join us for the Akron2Akron Downtown Christmas History Walking Tour and After Party on Saturday December 12th. The Walking Tour starts at 4pm and is free to the public and is led by Joanna Wilson the author of The Story of Archie the Talking Snowman and Akron's History of Christmas Attractions. FIRST LOCK 3 JINGLE BELL BASH: To benefit Ronald McDonald House of Akron. December 12th at 6pm inside Lock 3. Admission is $10 and each party goer will receive 2 tickets to a raffle, one drink ticket, and food. There will be coffee, hot chocolate, Thirsty Dog's Christmas Ale, soda, holiday cookies and hor d'oeuvres available. Guests will also have free access to ice skate and play putt putt golf during the event. SPECIAL EVENTS: Need something to make your winter weekends a little warmer? Stay tuned to the website for more events and activities throughout January and February. FOOD AND BEVERAGE: The concession stand at Lock 3 offers chili, soups and other hot items to warm skating and sledding enthusiasts. Akron's own Thirsty Dog brews are offered, including Lock 3 Lager. Coca Cola soft drinks and hot chocolate are also available.